This post about the 25% off Madewell new season essentials contains affiliate links. Please read this blog’s disclosure post for more info. Inject your wardrobe with subtle color with Madewell’s Brownstone Flecked Pullover Sweater (now $60). Madewell is one of my favorite stores!! I love their fun, modern takes on staple pieces. 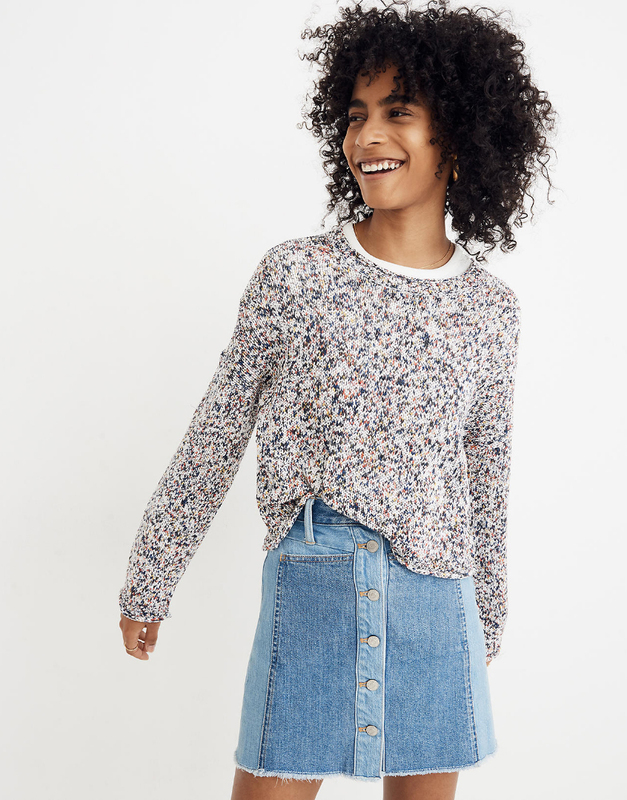 Madewell just unveiled its early Spring 2019 collection (more on that later in this post) and to celebrate they’re offering 25% off the season’s essentials. In general Madewell’s clothing puts a smile on my face. I find their online styling often uninspiring. That’s why I usually head to the store once a month or so to see how the items translate in real life. I might have missed how cute the Brownstone Flecked Pullover Sweater (now $60) is had I relied on the website only! It’s a good length and highly layerable. I love the slightly belled sleeves. The sweater is shown with this skirt, which is sadly excluded from the promo but which I also liked on. And just so you know the sweater also comes in two Spring-ready solid colors. 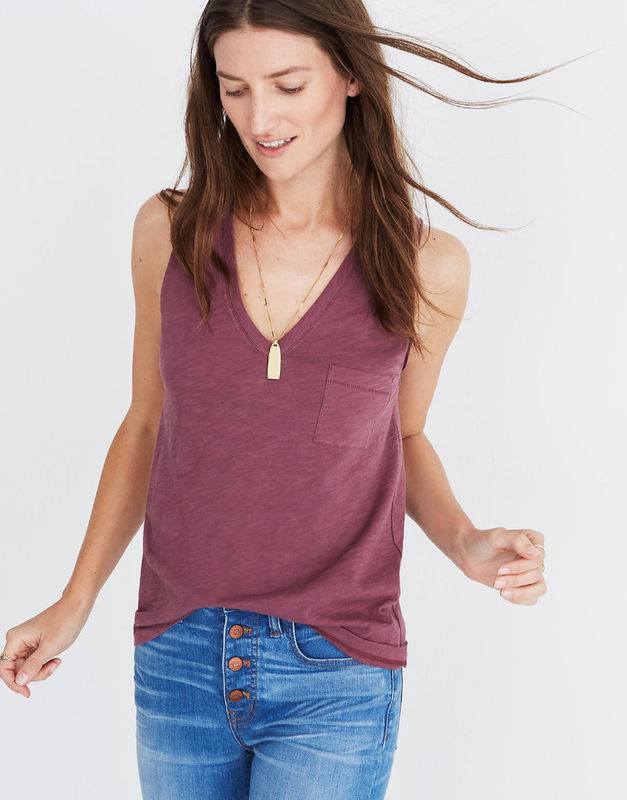 The list of Madewell new season essentials includes their awesome Whisper Cotton V-Neck Pocket Tank (now $14, above in one of eleven colors). This top is a staple in my closet! It makes a great layering piece. I wear long-sleeve tops under it in winter and sweaters over it. Come Spring, the tank top looks great under a light or midweight jacket. I also works well over spaghetti strap dresses and with midi skirts! There is a striped version of the Whisper Cotton Tank too and it pairs very well with the Oversized Jean Jacket in Lunar Wash (now $96). Elsewhere, I’m delighted to see that all three sizes (small/medium/large) of the Drawstring Transport Tote are included in this promotion! I own the small in two colors and use it very often — and I’m tempted to buy one of the large size in the buttery English Saddle colorway during this promo. Below, my top 25 picks from the Madewell new season essentials promo, which ends tonight. EVERYTHING FROM THIS POINT DOWN IN THE POST IS EXCLUDED FROM THE PROMOTION. Before you place your Madewell new season essentials promo order, you might want to take a cruise through the new arrivals! 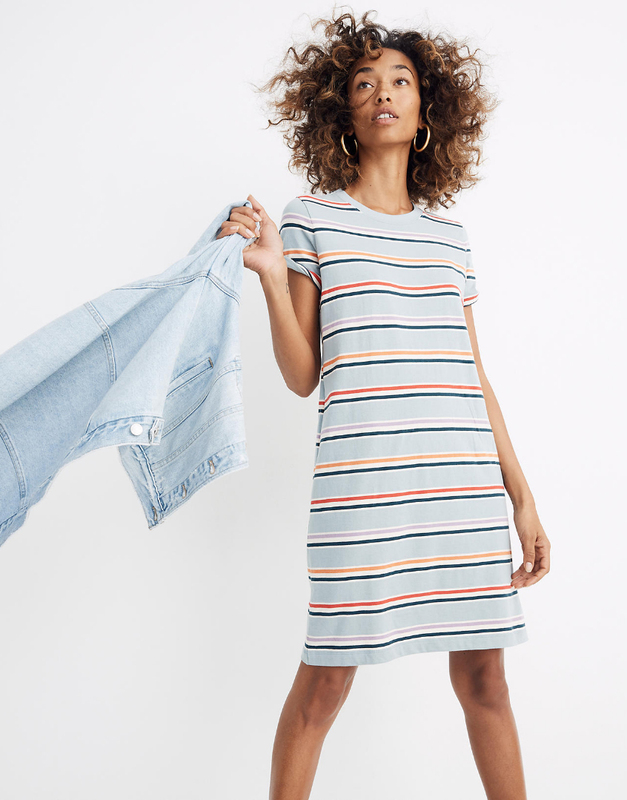 The Tee Dress in Alchester Stripe ($62, above) holds tons of styling potential. I’d pair it with the Medium Transport Tote ($158) in Wisteria Dove — aka lavender. I’m delighted by the latest arrivals that push me out of my comfort zone. Patchwork quilted coats are a huge trend in NYC right now. Madewell’s take on the trend is the Patchwork Wrap Jacket ($158). I find it very appealing! I’d wear it over a simple slip dress. Madewell has a way of making me consider items I normally wouldn’t. For example, I’m pretty solidly anti-jumpsuit yet still tempted by the Top-Stitched Coverall Jumpsuit ($138). I think it and many other things would look very cute with the Kiera Mule Sandal ($128). I also have my eye on the latest pattern of the Butterfly Stripe Top. This season it’s the Floral Embroidered Butterfly Top in Stripe ($85). You can see a previous season’s version on me here. Below, my picks from the Madewell new arrivals. Reminder that these items below are all excluded from the Madewell new season essentials promo — for picks from that promo, scroll up!